Starbucks expects to sell a record number of gift cards to last-minute shoppers on Christmas Eve. Last year on Dec. 24, it sold about 1,700 gift cards per minute, and Starbucks (SBUX) estimates that one in seven U.S. adults received one during the 2014 holiday season. 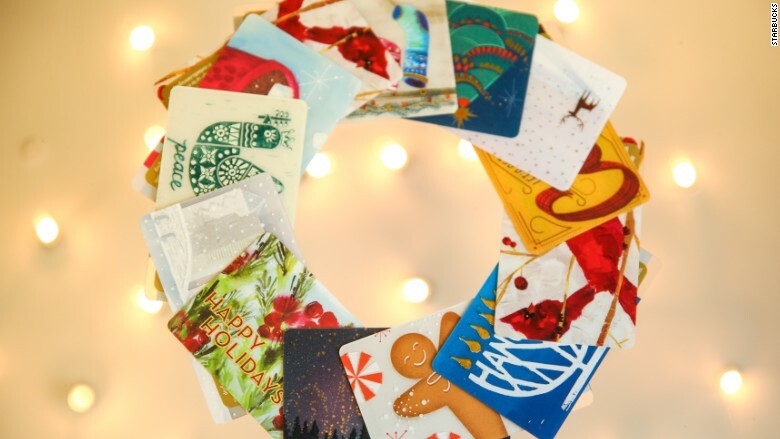 The cards are so popular all year round that more than a third of all Starbucks transactions in the U.S. and Canada are paid via gift card. Gift cards of all kinds are actually the most-requested gift for the eighth year in a row, according to a National Retail Federation survey. On CardHub's list of the most-popular choices this year, Visa (V) gift cards hold the top spot, followed by Amazon (AMZN) and American Express (AXP). Starbucks ranks at No. 7, but users can register the cards with the chain's rewards program to get free food and drinks. The system has paid off. More than $5 billion was loaded on to Starbucks cards in the 12 month period ending in September, the company said Tuesday. 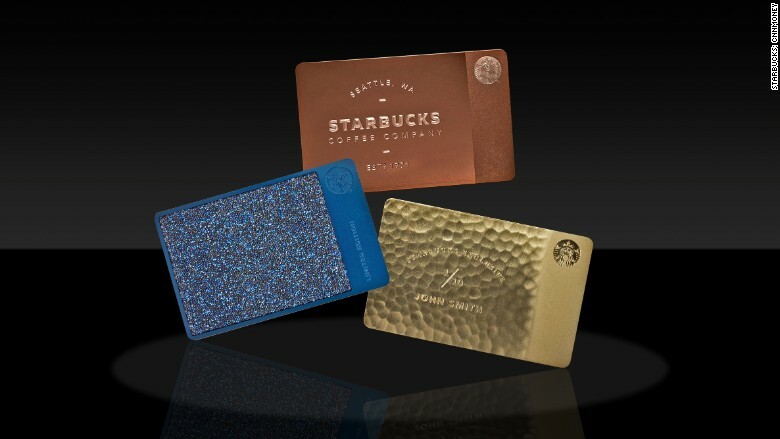 For the truly die-hard fanatic, Starbucks makes a limited number of "Premium Cards" each year. The premium collection cards cost $200 and come pre-loaded with $50. This holiday season, they're made of stainless steel and encrusted with Swarovski Crystals. A few of the Starbucks "Premium Cards."